I started out as a painter in an environment where painting was something very powerful and I actually never lost that feeling. I never doubted painting. Color sugar lift and spit bite aquatints with soft ground etching and drypoint on gampi paper chine collé. Image size: 44¾ x ￼35¾"; paper size: 52¾ x 42¾". Edition 10. Published by Crown Point Press and printed by Fanny Retsek. Image size: 44¾ x 35¾"; paper size: 52¾ x 42¾". Edition 10. Published by Crown Point Press and printed by Fanny Restek. Color sugar lift aquatint with soft ground etching and drypoint. Image size: ￼￼44¾ x ￼35¾"; paper size: 52¾ x 42¾". Edition 10. Soft ground etching on gampi paper chine collé. Image size: 24 x 19"; paper size: 31 x 25". Edition 20. Color spit bite aquatint and soft ground etching on gampi paper chine collé. Color sugar lift aquatint with soft ground etching and drypoint on gampi paper chine collé. Since 2007, von Heyl has also made works on paper by collaging woodcuts, silkscreens, lithographs, and Xerox copies, among other materials and techniques. In a text she wrote for Artforum in 2008, she described how she layers “different kinds of prints on top of one another, drawing on them, sticking things onto them… Usually you do not put a woodcut on top of a lithograph on top of a silk screen. [But] I have always been a sucker for the look of prints and have often faked that look in my paintings, so maybe it makes sense that I am using printing techniques now in the same way that I paint, so that one cannot follow the steps. These steps often contradict themselves, making an image that ultimately does not reveal its roots. And that’s what makes it, in the end, something that has presence.” At Crown Point Press in 2014, von Heyl layered aquatint, etching, and drypoint methods to create ten gestural and graphic prints. Charline von Heyl was born in Mainz, Germany, in 1960. She studied with Jörg Immendorff at Kunstakademie Hamburg from 1982–84 and with Fritz Schwegler at Kunstakademie Düsseldorf. She later worked for several years for Immendorff as his assistant in Düsseldorf. She moved to New York in the mid-1990s, and since then has had solo exhibitions at many institutions including the Institute of Contemporary Art, Boston; the Tate Liverpool; the Institute of Contemporary Art, Philadelphia; the Dallas Museum of Art; and the Vienna Secession. She was included in the influential “The Forever Now: Contemporary Painting in an Atemporal World” at the Museum of Modern Art, NY, in 2014. Her work is in the permanent collections of many museums including the Tate, London, U.K; the Kunstmuseum, Bonn, Germany; the Musée d’Art Moderne de la Ville de Paris, Paris, France; the Museum of Contemporary Art, Los Angeles, CA; the Museum of Modern Art, New York, NY; the Museum of Contemporary Art, Chicago, IL; and the San Francisco Museum of Modern Art, San Francisco, CA. Von Heyl lives and works in both New York, NY, and Marfa, TX. She is represented by Friedrich Petzel Gallery in New York, Galerie Gisela Capitain in Cologne, and 1301PE in Los Angeles. 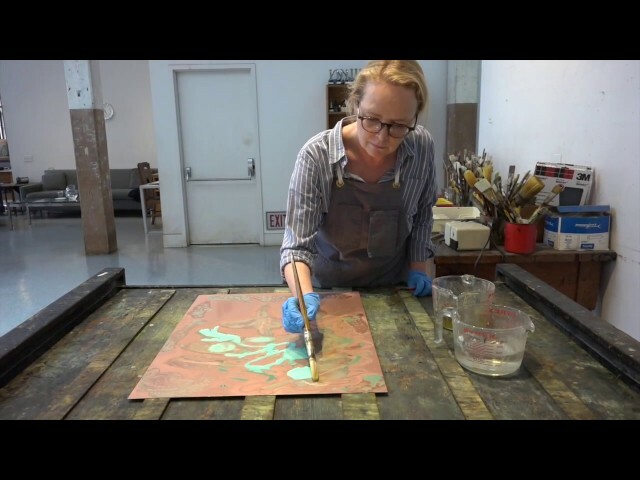 See Charline von Heyl working on her prints in the Crown Point studio.